Toward the end, Brian Azzarello's Wonder Woman Vol 5: Flesh gets really interesting, even downright gripping. But, getting there has its highs and lows. I'm all for subtle storytelling, but I think Azzarello fails in clueing the reader in on the stakes of Wonder Woman's conflict, and that prevents the reader from really getting entrenched in the story. Azzarello still writes Diana well, but character development takes too much a backseat to go-nowhere action plots here for my tastes (even if well-drawn by Cliff Chiang and Goran Sudzuka). Wonder Woman Vol. 4: War's great cliffhanger was that Diana sacrificed Ares to defeat Zeus's mad First Born, and therefore took the mantle of the God of War on herself. This is a great development, getting to the very dichotomies inherent in the Wonder Woman character -- how she can be an ambassador of peace (in some continuities) but still solve her problems mostly through the use of superheroic violence. What would it mean for Wonder Woman to be the God of War? What sensibilities could she bring to war? What could having Wonder Woman be the God of War say about the nature of war, and whether war itself is "God-given" or a creation of man? I was very excited to see what Azzarello would do with all of this in Flesh. But there are none of these answers in Flesh, and moreover, having just finished reading the book, I have no better idea than when I started as to what it would mean for Diana to be an Olympian god even in a mundane practical sense. Diana is at one point drawn to Olympus to a kind of celestial board meeting, but she refuses to take War's chair, for no reason clearly stated. As near as I can tell, Azzarello's Olympian gods walk the earth freely, so it's not as though Wonder Woman would be giving up her old life to claim the mantle. If indeed being an Olympian god is a "couple meetings a month" kind of thing, why wouldn't Wonder Woman embrace it, especially if it meant the chance to do more good in the world? Azzarello is never clear on this point, nor what it means at the end of the book when Diana finally accepts her role. Instead, the book spends at least three of its six main issues (plus the Wonder Woman #23.2: First Born Villains Month issue) on the demigod Cassandra kidnapping her half-brother Milan in an attempt to find the First Born; this fails through the intervention of Wonder Woman and friends, and so later Cassandra kidnaps the god Dionysus instead. This is a long sequence to largely come to naught, and also somewhat repetitious -- the characters expound again on how they don't trust Hermes, Orion bristles again over being told what to do, and so on. When there's so much new ground to cover, re-treading old ground is especially trying. In addition, the second half of the book involves Diana trying to find her human charge, Zola, who's run away under the influence of Eris, aka "Strife." That Zola should run away when she's needed Diana for so long to protect her baby is itself a tad unbelievable (except for the understated "god-influence"), but even more so that Strife arrives, gives everyone in Wonder Woman's band gifts that seem obviously designed to unnerve them, and then Diana leaves Strife "in charge" of Zola when she has to depart; it's a far too convenient gaffe on Diana's part. Equally it's not clear to me Strife's intentions -- she claims she means to kill Diana, but then ... decides not to? -- nor for what reasons Apollo sends Dionysus after Zola, since he, too, doesn't seem to go through with whatever he's planning. What worked here for me, mainly, was the struggle between the captive First Born and Apollo, who tortures the First Born in a series of increasingly gruesome sequences in an effort to gain the First Born's fealty. That the First Born eventually escapes is no big surprise, but as this becomes the main plot, Azzarello loads all the book's good moments into the end -- Olympus imploding quite impressively, Hera getting her powers back, Hera restoring the ensorceled Amazons, the First Born's blood tendrils and life-leaching powers. Here again, I don't think Azzarello lets the reader in on real stakes -- what does it mean in the lives of normal people that the First Born is now king of the gods? -- but these are overall dynamic developments, many of which touch on storylines from the very beginning of the run. 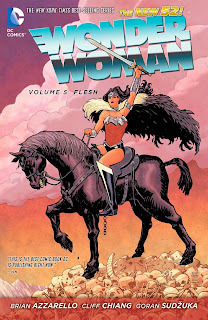 It is frustrating, frankly, not being able to rave about Wonder Woman Vol 5: Flesh more ardently, given how daring I thought Azzarello's first Wonder Woman books were, and the number of risks the series took. Azzarello still writes a very down-to-earth Wonder Woman, a warrior, friend, and strong leader, and my qualms are not at all with how Azzarello imagines Wonder Woman, simply that the plot fails to distinguish itself (I had much the same concerns with Wonder Woman Vol. 4: War). If you'd asked me at Volume 1, I'd have hoped Azzarello's Wonder Woman run never ended, but now I think next volume's finale is probably about due (except, indeed, for my concerns about the run to follow). The greatest loss with this run's end is probably not having Cliff Chiang drawing the book any more; even when the story drags, Chiang still draws it nicely, and Goran Sudzuka matches him well in the fill-ins. I guess perhaps volume six will be the final word on how this run is ultimately remembered. Later this week, we'll celebrate the start of Arrow Season 3 with Green Arrow Vol. 5: The Outsiders War.